49 Code of Federal Regulations – aka ‐ 49 CFR, CFR Title 49 ‐ Transportation is one of fifty titles comprising the United States Code of Federal Regulations (CFR). Title 49 is the principle set of rules and regulations issued by the Departments of Transportation and Homeland Security, regarding transportation and transportation related security. Appurtenance – The EPA defines an Appurtenance as any equipment or device which is used for the purpose of transferring a pesticide from a stationary pesticide container or to any refillable container, including but not limited to, hoses, fittings, plumbing, valves, gauges, pumps and metering devices. CERCLA ‐ Comprehensive Environmental Response, Compensation, and Liability Act of 1980 aka ‐ Superfund, is a United States federal law designed to clean up sites contaminated with hazardous substances and pollutants, often administered by the EPA. Container means any package, can, bottle, bag, barrel, drum, IBC, tank, or other containing‐device (excluding any application tanks) used to enclose a pesticide. Containment pad means any structure that is designed and constructed to intercept and contain pesticides, rinsates, and equipment wash water at an area in which pesticide is transferred out of or into a container. Containment structure refers to either a secondary containment unit or a containment pad. EPA Establishment Number ‐ aka ‐ EPA Est. No., EPA Establishment No. This number indicates the final location where the product was produced. EPA Establishment numbers are unique and assigned to a physical location. An EPA establishment number consists of a company number followed by a state abbreviation for the state that the establishment is in, followed by a sequential number specific to the physical location. A number containing “MO” indicates the product was manufactured in Missouri. The EPA Est. No. is required on all pesticide product labels. EPA Registration Number ‐ aka ‐ EPA Reg. No., EPA Registration No. This number is given to each pesticide when registered for use by the EPA and includes registrant’s EPA company number and a subsequent or sequential number for the pesticide group. The EPA Reg. No. is required on all pesticide product labels. EPA SSURO ‐ Stop Sale, Use or Removal Order ‐ Issued by the EPA directing a company to immediately stop the sale, use, and removal of a registered pesticide product(s), and directed to Registrants, Retailers, Distributors, Commercial Applicators, Custom Blenders, and Pesticide Users. External Sight Gauges ‐ Pesticide‐containing hoses or tubes that run vertically along the exterior of the container from the top to the bottom. These gauges are prohibited on stationary containers of liquid pesticides. FIFRA ‐ Federal Insecticide, Fungicide, and Rodenticide Act ‐ The federal law that sets up the system of pesticide regulation to protect applicators, consumers, and the environment. FIFRA is administered and regulated by the EPA and appropriate environmental agencies of each state. Before EPA may register a pesticide under FIFRA, the applicant must show that using the pesticide according to specifications will not generally cause unreasonable adverse effects on the environment or the handler. Intermediate bulk container or IBC means a rigid or flexible portable packaging, other than a cylinder or portable tank, which is designed for mechanical handling. The US Department of Transportation hazardous materials regulations define IBCs in accordance with United Nations performance standards. IBCs range in size from 119 gallon capacity to 793 gallon capacity. Leak Proofness Test for IBCs – As required by the US DOT, this test must be conducted on IBCs designed to contain liquids, including pesticides, to determine that the containers will not leak, especially during transport. This test is required to be performed every 2.5 years (30 months). Misbranded Pesticide ‐ Describes a product with an absent, incomplete or illegible label. NFPA Rating ‐ National Fire Protection Association Rating aka ‐ NFPA 704: Standard System for the Identification of the Hazards of Materials for Emergency Response – This standard is maintained by the NFPA. It defines the “fire diamond” used by emergency personnel to quickly and easily identify the risks posed by hazardous materials. It helps determine what, if any, special equipment should be used, procedures followed, or precautions taken during the initial stages of an emergency response. Net Contents – Details volume or weight of product packaged in a pesticide container. The Net Contents is required on all pesticide product labels. If the pesticide is a liquid, the net content statement shall be expressed in conventional American units of fluid ounces, pints, quarts, and gallons. If the pesticide is solid or semi‐solid, the net content statement shall be in terms of weight expressed as pounds and ounces. Net contents is required on all pesticide labels. One‐Way Valve ‐ EPA regulations define a one‐way valve as a valve that is designed and constructed to allow virtually unrestricted flow in one direction and no flow in the opposite direction, allowing the withdrawal of material from the container, but not the introduction of material into the container. EPA recognizes that there could be a small amount of seepage of material before the one‐way valve would engage against any back flow. Pesticide Container and Containment Rule ‐ The goal of this EPA ruling is to facilitate the public’s ability to determine who is subject to the rule and how to comply. Most recent version was established October 2010 intended for Registrants, Retailers, Distributors, Commercial Applicators, Custom Blenders, and Pesticide Users for appropriate storage and handling of pesticide products. Portable Refillable Containers – [PRC] This term incorporates 2 definitions; Portable container and Refillable container. 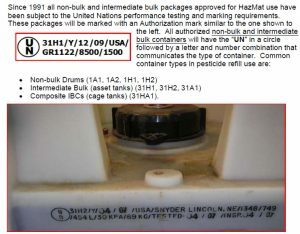 It includes all non‐stationary pesticide containers that are designed and labeled to be filled with a pesticide more than one time. Pressure Relief Valves ‐ aka PRV ‐ Used to control or limit the pressure in a system. The pressure is relieved by allowing the liquids or gasses to flow from an auxiliary passage out of the system. Refiller means a person who engages in the activity of repackaging pesticide product into refillable containers. This could include a registrant or a person operating under contract to a registrant. Refilling establishment means an establishment where the activity of repackaging pesticide product into refillable containers occurs. Repackage means to transfer a pesticide formulation from one container to another without a change in the composition of the formulation, the labeling content, or the product’s EPA registration number, for sale or distribution. Secondary containment unit means any structure, including rigid diking, that is designed and constructed to intercept and contain pesticide spills and leaks and to prevent runoff and leaching from stationary pesticide containers. Service Container ‐ a container used exclusively for the purpose of applying the pesticide. It must be part of a pesticide transfer by the applicator from a storage container to a container intended exclusively for application purposes. A Service Container is not subject to the same EPA rules as a Refillable Container. Stationary pesticide container is defined as a refillable container that is fixed at a single facility or establishment or, if not fixed, remains at the facility or establishment for at least 30 consecutive days, and that holds pesticide during the entire time. Stationary pesticide containers are subject to the regulations if they are designed to hold undivided quantities of pesticides equal to or greater than 500 gallons for liquids or 4,000 pounds for dry pesticides. Tamper‐evident device refers to a device which can be visually inspected to determine if a container has been opened. United Nations (UN) Packing Group III ‐ An indication of the lowest degree of hazard within a hazard class or division of the United Nations dangerous goods regulations. 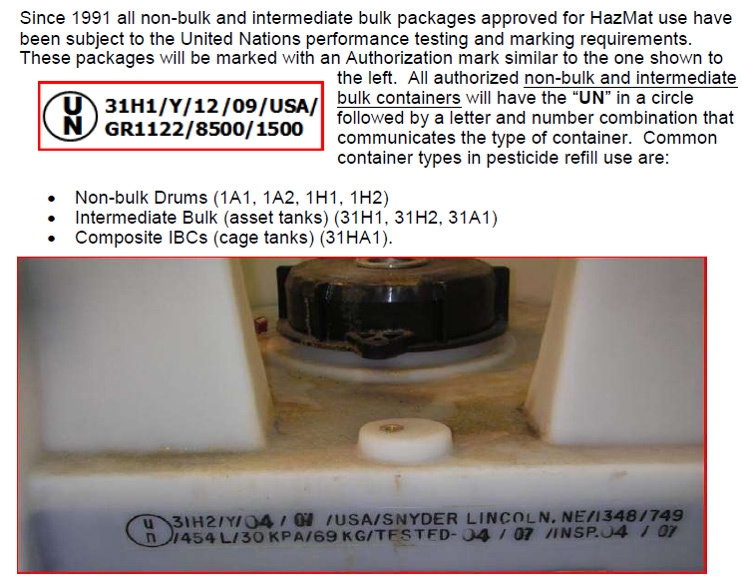 US DOT HazMat PGIII for Non Bulk and Intermediate Bulk Containers ‐ Since 1991, all non‐bulk and intermediate bulk packages approved for HazMat use have been subject to the United Nations performance testing and marking requirements and must be marked with an authorization mark with the UN in a circle followed by a number and letter combination.